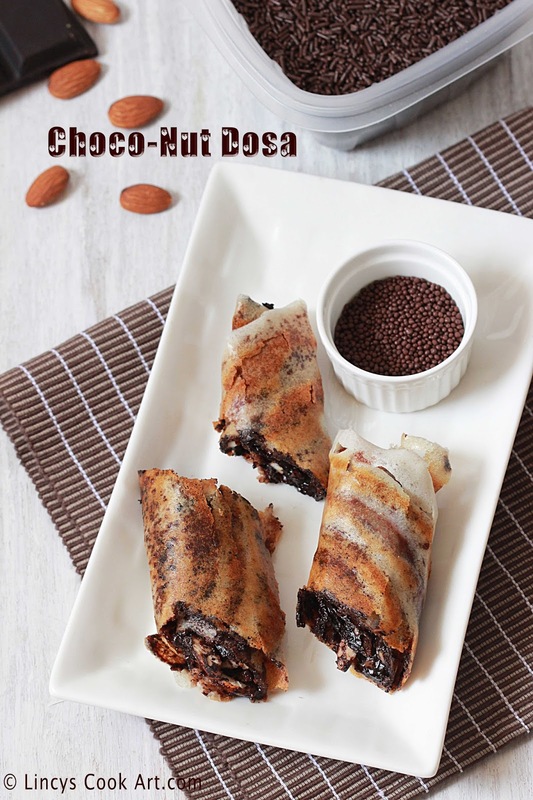 Choco-nut Dosa is crispy dosa filled with Chocolate and nuts combination. I have shared many dosa varieties in my blog. I have earlier shared Nutella and banana dosa which is similar to this dosa. But varies in texture and also taste. This is crunchy and slightly gooey insdide with a crispy dosa, the nutella with banana one is totally gooey inside with a crispy outside. Both are kids friendly recipe and this one is healthier than nutella one as it has dark chocolate and nuts in it. You could serve this as a snack or dessert for kids. Even adults love this combo. Grease the dosa tawa and add a ladle full of dosa batter and spread to make concentric circles. Drizzle little oil over the dosa and cook till crispy. Sprinkle some nuts of choice. You could add some dry fruits like raisins too if you like. Roll the dosa tightly and cut them in a slanting manner. Serve with Chocolate sauce and some chocolate sprinkles if you like it more chocolaty. Note: Do not over cook after adding chocolate in dosa. The chocolate might dry and burn. Kids will fall in love with this dosa, looks so yum..